FILE - Native American tribal members sing and drum in the rotunda of the Capitol in Olympia, Washington. The gathering was part of Native American Indian Lobby Day and supported issues such as the awareness of missing and murdered indigenous women in Washington state. Over the past several months, dozens of women have come forward with allegations of sexual abuse by celebrities and politicians, prompting a global movement against sexual harassment. But Native American advocacy groups say far too little attention is focused on the issue of sexual violence against native women, which has been going on since colonial times, and that the vast majority of abusers are never brought to justice. Criminal jurisdiction in Indian Country (on reservations and other lands held in government trust) is shared by federal, state and local governments, depending on the location of the crime and the race of the perpetrator. A 1978 Supreme Court ruling prohibits tribes, recognized by treaties to be sovereign nations, from prosecuting non-native offenders who commit crimes on Indian reservations. 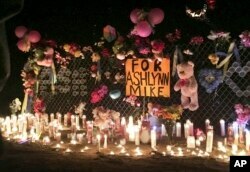 FILE - In this May 3, 2016 photo, candles burn at a memorial for Ashlynne Mike, who was abducted and murdered, on the Navajo Nation southwest of Farmington, New Mexico. "This creates a racialized kind of impunity in which non-native people learn of their privileged racial status and then seek to exploit it in land where the only governing body that has the power to arrest and prosecute them is prevented from doing so," said Amy Casselman Hontalas, adjunct professor of ethnic studies at San Francisco State University and author of Injustice in Indian Country: Jurisdiction, American Law, and Sexual Violence Against Native Women. Moreover, federal attorneys decline to prosecute more than half of violent crimes committed in Indian Country — the majority of which (67 percent) involve sexual abuse, according to a 2010 report by the U.S. Government Accounting Office. In a partial fix to the problem, then-Senator Joe Biden of Delaware authored the Violence Against Women Act (VAWA) in 1994, which has been reauthorized several times. VAWA 2013 gives tribes the authority to arrest and prosecute non-Indians who commit certain domestic violence crimes within their territory, but it stipulates they either must be living or working on tribal lands, and must be "the spouse, intimate partner or dating partner of an Indian living in Indian Country or a tribal member." "It's a very narrow carveout," Casselman Hontalas said. "It kind of makes you wonder whose lives are valuable here. And if we determine that tribal criminal jurisdiction is a good thing, then why would we not extend it?" Compounding matters, violence against native women isn't well-tracked, and many crimes aren't reported. Tribes also lack the funds to address victims' needs. Several new laws have been introduced to fill some of these gaps, said Caroline LaPorte, senior policy adviser on Native Affairs for the National Indigenous Women's Resource Center, which advocates for changes in the law. "Savanna's Act, which was introduced by Senator Heidi Heitkamp [a Democrat from North Dakota] in October 2017, would increase coordination between law enforcement agencies when a Native American goes missing or gets killed," LaPorte said. The Securing Urgent Resources Vital to Indian Victim Empowerment Act, which Senator John Hoeven introduced in September 2017, would increase funds to help tribes provide culturally relevant medical care, counseling, legal and other services to victims of violence. Hoeven, a Republican from North Dakota, is chairman of the Senate Committee on Indian Affairs. And the Native Youth and Tribal Officer Protection Act, which Senator Tom Udall, a Democrat from New Mexico, introduced in December 2017, would extend protections both to children and law enforcement personnel involved in domestic violence incidents on tribal lands. Meanwhile, VAWA 2013 is set expire in September 2018, and there is some uncertainty about whether it will be reauthorized. In 2013, 22 senators, all Republicans, voted against the bill. Opponents argue it costs the government too much and violates constitutional limits on the federal government's power. President Donald Trump has proposed boosting the VAWA budget to about $485 million next year, pulling from funds set aside for crime victims. And, more than a year into office, he has not yet appointed anyone to head the Justice Department's VAWA office. Still, LaPorte said she's certain Congress will reauthorize VAWA. "I just choose to be optimistic about it," she said.